Secretary of State: The US stands with the Jewish people and Israel in their fight against the world's oldest form of bigotry. 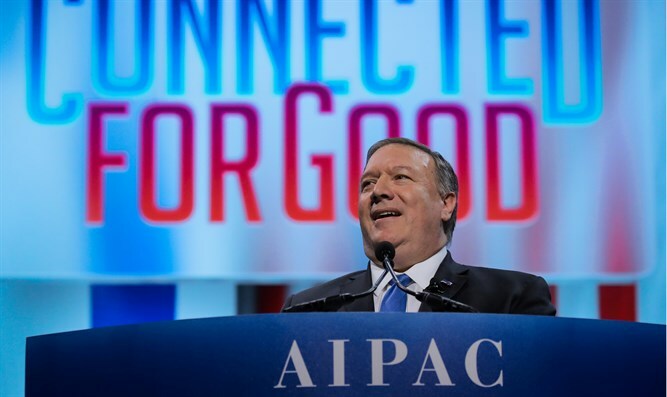 US Secretary of State Mike Pompeo on Monday addressed the AIPAC Policy Conference in Washington, DC. “As most of you have probably seen by now, President Trump and Prime Minister Netanyahu signed a decree affirming Israel's sovereignty over the Golan," said Pompeo, recalling a visit with his boys through the sites of the tank war on the Golan during the 1973 Yom Kippur War. “I am deeply worried about an old threat that is reemerging – the threat of anti-Semitism,” said the Secretary of State, who noted that anti-Semitism “is a cancer metastasizing in the Middle East, America, and Europe and indeed sadly in the United States as well." “The United States stands with the Jewish people and Israel in the fight against the world’s oldest bigotry. This bigotry is taking on an insidious new form in the guise of anti-Zionism. It’s discussed by our media. It’s supported by certain members of Congress, none of whom I suppose are here tonight,” he continued. “Don’t get me wrong, criticizing Israel’s policies is an acceptable thing to do in a democracy. But criticizing the very existence of Israel is not acceptable. Anti-Zionism denies the very legitimacy of Israel as the nation-state of the Jewish people,” stressed Pompeo. “Friends, let me go on record: Anti-Zionism IS anti-Semitism. The Trump administration opposes it unequivocally and we will fight for it relentlessly,” he made clear. Pompeo criticized those politicians who “think that anti-Semitism can actually win them votes. And we have to correct the record. We all have an obligation to do so, because Israel should be admired, not attacked. Embraced, not vilified. Emulated, not ostracized." The US, since pulling out of the deal, has enacted “the strongest pressure campaign in history against Iran and its proxies, and they are feeling the pain,” continued the Secretary of State.